Double exposure photography is an awesome effect that merges two photos together. 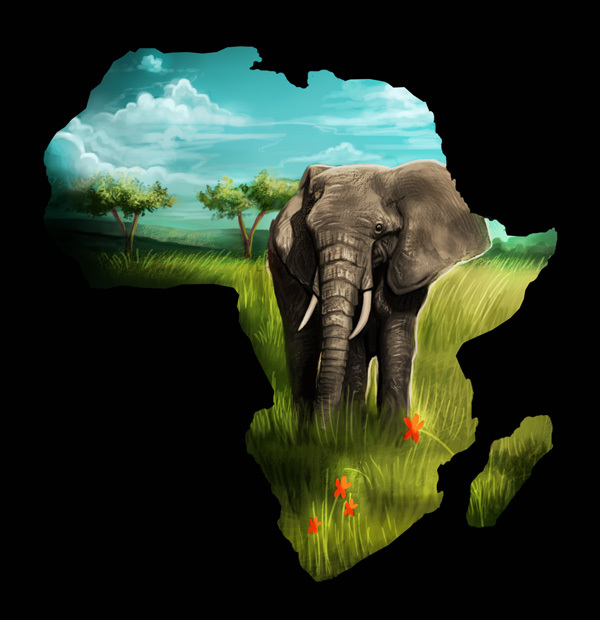 In this tutorial, I’ll show you how to create this effect by turning two isolated images into a creative painting of a beautiful African scene! 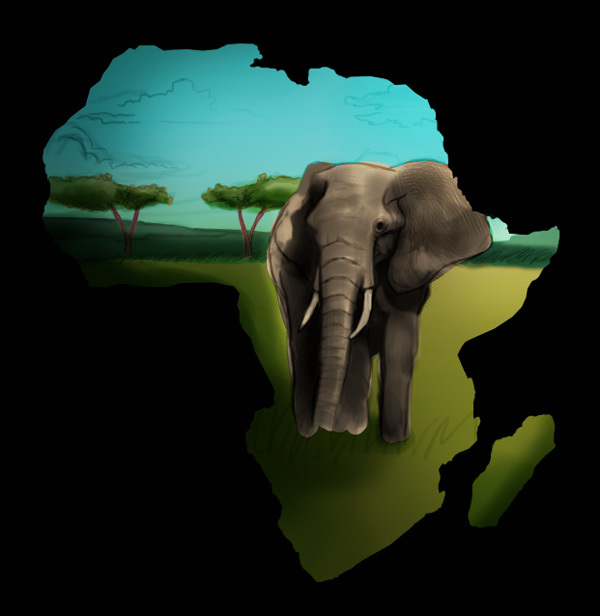 Learn how to set up your layers perfectly for painting, and how to use Layer Blend Modes to shade and highlight. Let’s get started! 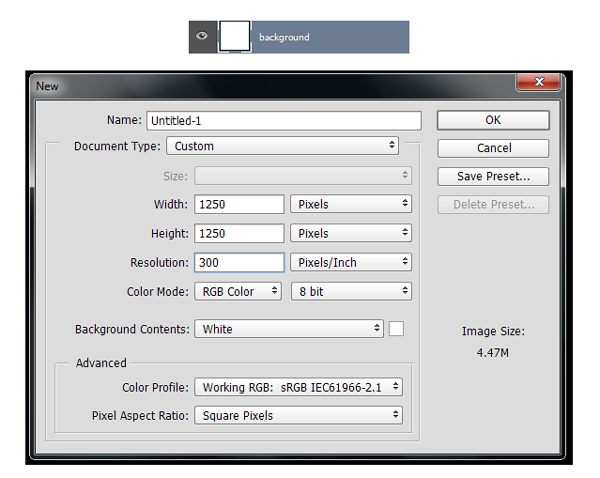 Create a New Document in Photoshop with a square layout, preferably 1250×1250 pixels at 300 dpi. 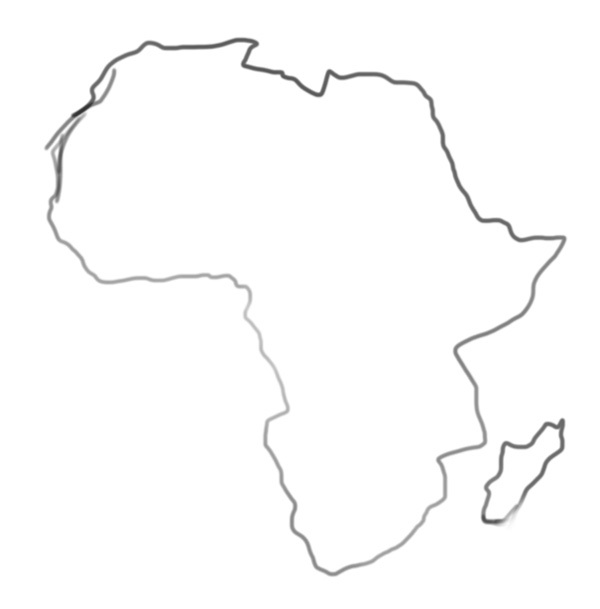 Copy and paste your Africa silhouette onto the document and resize it to make it larger. Lower the Opacity of your reference to 50%. Set the Foreground Color to black and use a Hard Round Brush to trace the silhouette on a New Layer. Here is the initial sketch. 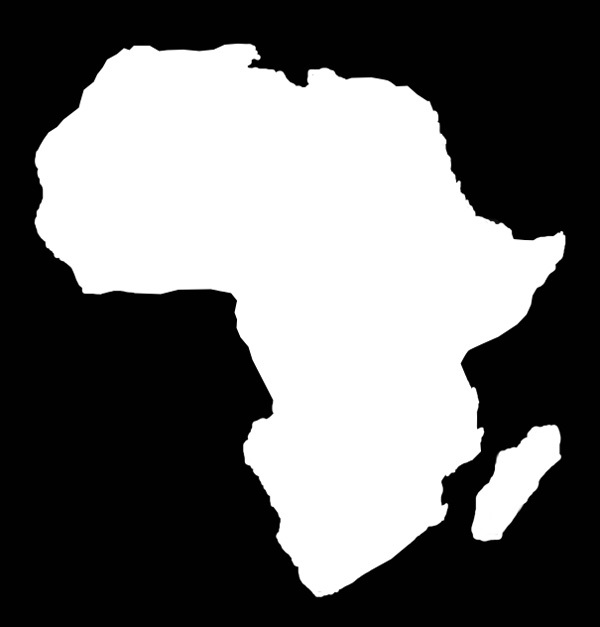 Change the background to black and fill in the Africa shape with white. When you’re finished you should be left with a simple flat base. Now that you have the shape of Africa in place, start drawing your elephant within it. 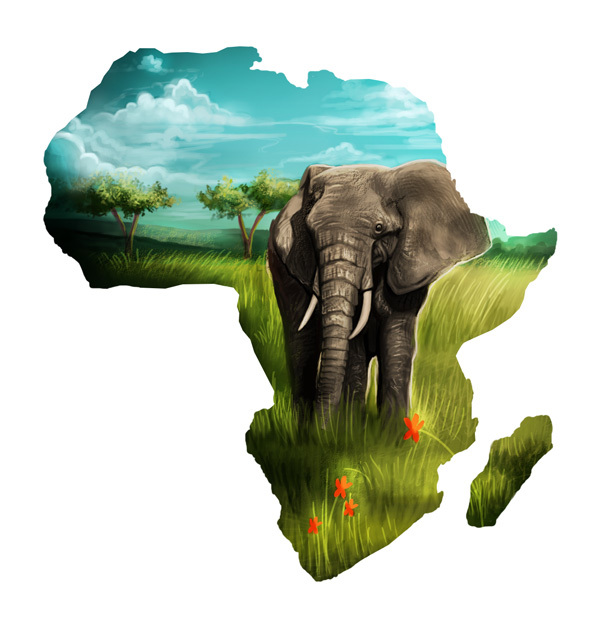 Do this by setting a New Layer as a Clipping Mask to the base shape. 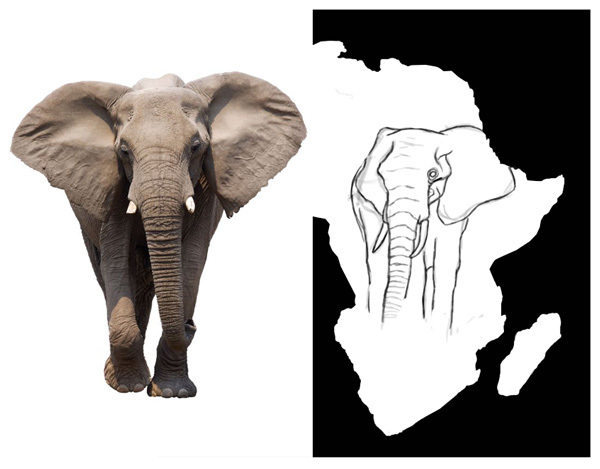 Use this reference as a guide to get the main elements of the elephant down. Have fun with this beautiful scene! Draw a quick landscape with trees and grass. Here is the final sketch. First things first, organize your layers like the ones below. 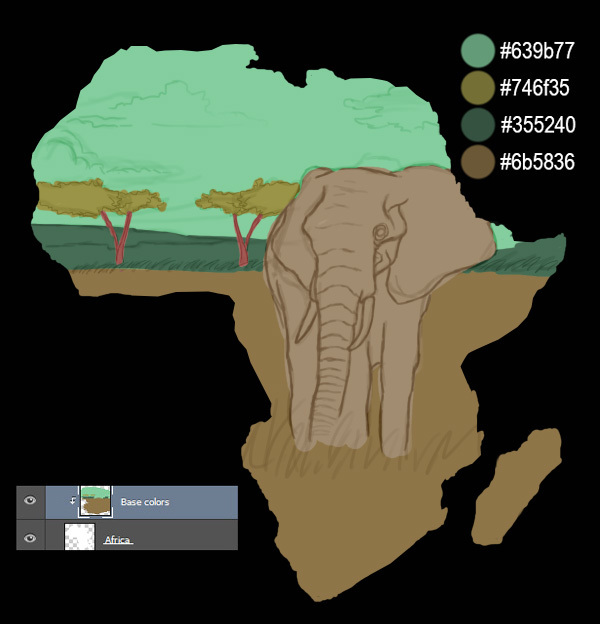 Paint the solid base colors for the elephant and landscape. 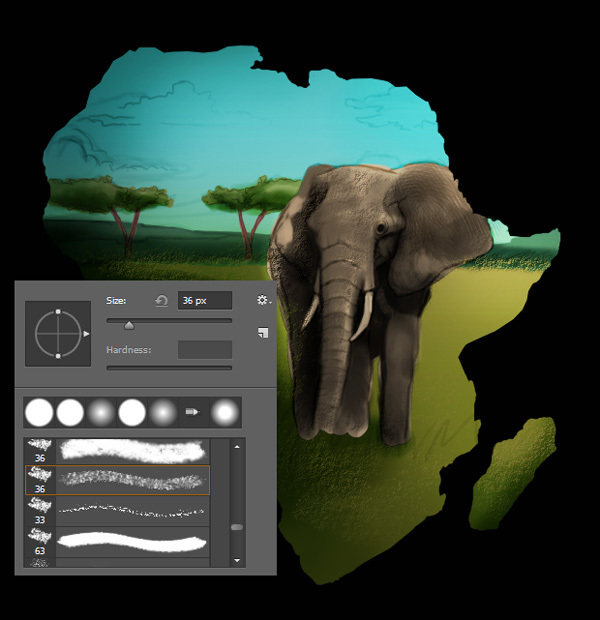 For each new layer of paint, set the layers as Clipping Masks to make sure the painting stays within the borders of the Africa outline. Now let’s add some shadows. Clip a New Layer to the base and set it to Multiply. 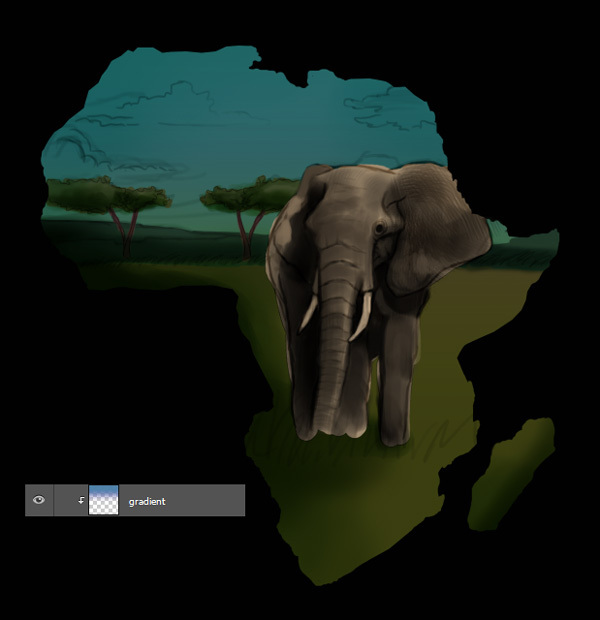 Use the Eyedropper Tool (I) to select colors from each area and begin painting shadows. 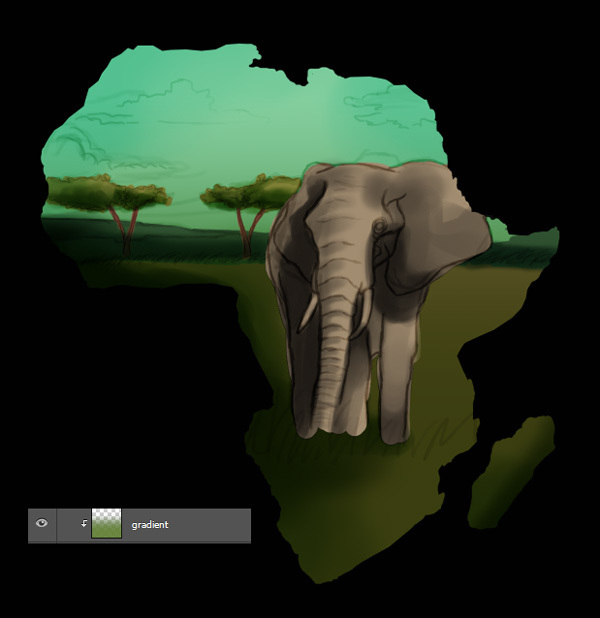 Use the Gradient Tool (G) to create a green to transparent Linear Gradient behind the elephant. This will help pop it out against the background. Do this same technique for the sky, this time using the color blue for the gradient. Because the layers are set to Multiply it’ll automatically make the painting darker. Since the painting is looking a little dark, let’s lighten it up a bit. 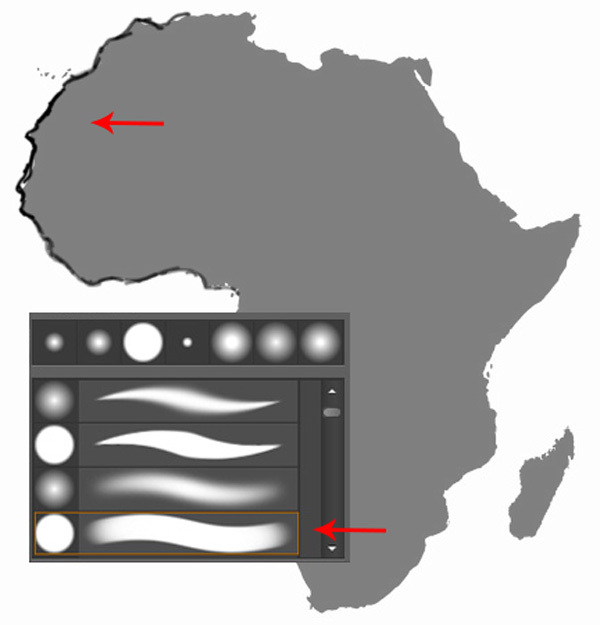 Add a New Layer and set the Blend Mode to Overlay. Now use the color white and a large Soft Round Brush to paint more light onto the scene. Since the sun is coming from the right side, I’ll concentrate all the light and highlights there. Time to add some texture! The best way to make anything realistic is to make sure it doesn’t look smooth. 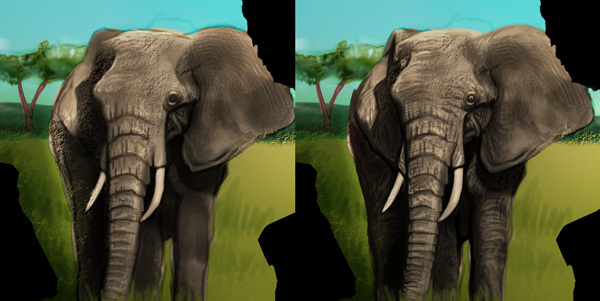 To cheat this effect, use a Chalk Brush from the Brush Presets panel to paint texture all over the painting. Another way to incorporate texture is to study your references. Zoom into your elephant photo to understand its skin texture and wrinkles. Set a layer to Linear Dodge (Add) and use the color white to paint white highlights on the skin to emphasize these wrinkles. Now that we’ve got a good base going you can focus on the details of this painting. 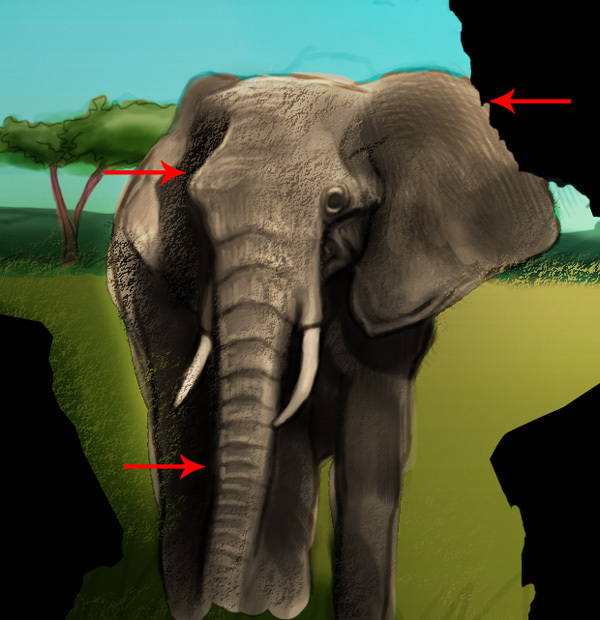 Using the same Hard Round Brush from earlier, begin working on cleaning up the details for the elephant. Make sure the Hardness is set to 100% to so that the lines stay nice and crisp. Don’t forget the background! Painting grass is really easy. Just use long linear brush strokes to convey a grassy field. 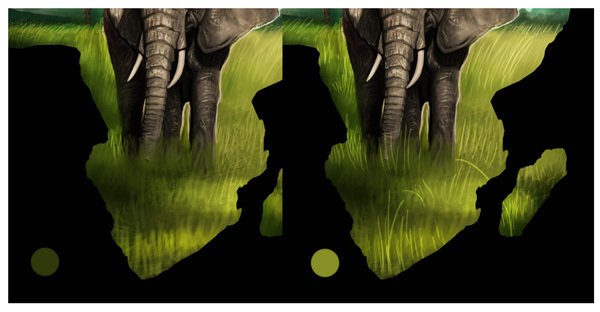 Add some dark grass to represent the shaded areas, and light grass to highlight the scene. Draw the outlines of the clouds and trees with a Hard Round Brush, and then make the clouds look extra fluffy by painting soft color using a soft brush. When the sun is behind the subject, rim light can occur. 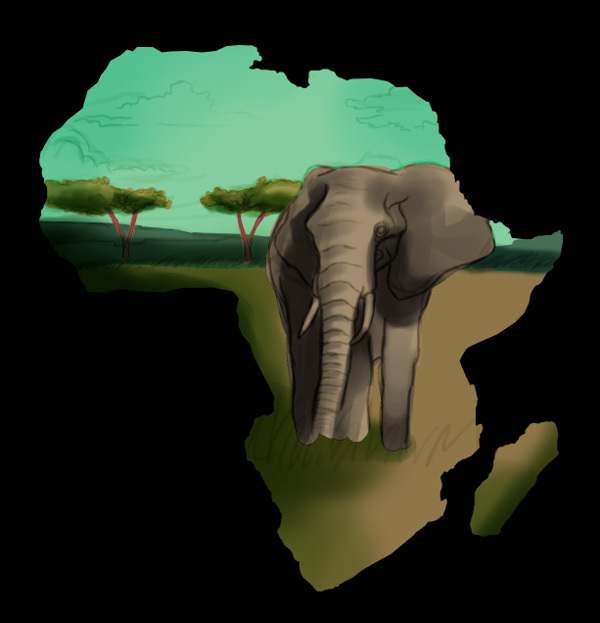 So outline the elephant with white highlights and incorporate more light into the scene in any areas that may need it. Finish this painting off by including some cute flowers in the front to show the foreground composition. And that’s it! If you prefer a white background, just change the background layer. Or experiment with different colors for a cool effect! I hope you’ve enjoyed this tutorial, have fun trying it out!